The Canadian Premier League’s ambition is its biggest allure. While its mantra — “For Canadians, By Canadians” — is painted prominently in offices and atop league letterheads, the CPL’s intention is often relegated to internal presentations and team-building sessions. Simply to be the No. 1 professional Canadian sports league by 2026, the year Canada will co-host the FIFA World Cup together with the United States and Mexico. “We are fuelling a movement that will make soccer a part of Canadian culture and identity,” said Scott Mitchell, CEO, Canadian Soccer Business. From anticipated, soon-to-be-revealed kit and merchandise deals to innovative media partners set to alter the way Canadians consume domestic soccer, the Canadian Premier League is making waves in the business community in the buildup to its April launch. 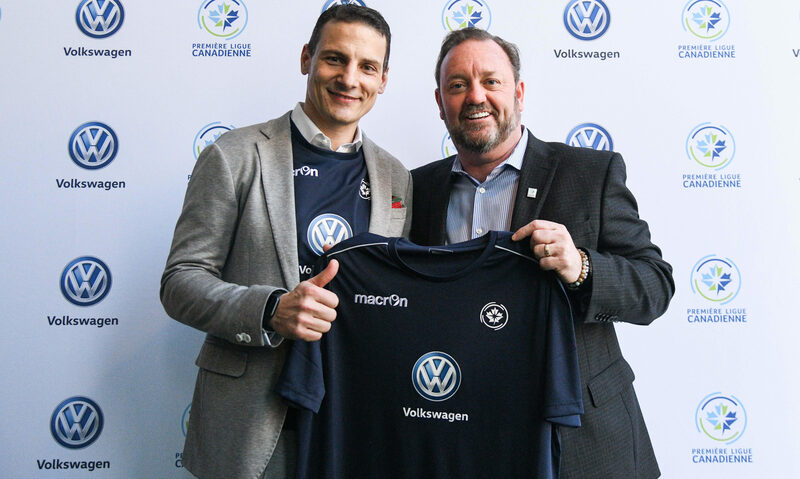 On Tuesday, Volkswagen Canada and the Canadian Premier League revealed a founding, multi-year partnership that will include national promotional and media assets in addition to an official jersey sponsorship. The partnership was negotiated by the Canadian Soccer Business (CSB) on behalf of the league. The multi-year deal will allow Volkswagen to uniquely connect with Canada’s growing nation of soccer supporters at all levels. This after a recent ReThink Management survey found nearly 60% of Canadian soccer fans prefer a top-tier, all-Canadian professional league to additional Major League Soccer franchises operating north of the border. The same survey found a high level of interest in a hypothetical Canadian first division prior to the Canadian Soccer Association officially sanctioning the CPL in 2017. “Volkswagen is a world-renowned brand and we are thrilled to welcome them to the CPL family as a founding partner with exclusive automotive sponsor rights,” said CPL Commissioner David Clanachan. The league’s founding partners are being provided an opportunity to own soccer in Canada in the lead up to the 2026 World Cup, the largest, most prolific sporting event Canada has ever hosted. It’s a structure that includes partnering with innovative, community-focused brands that believe in the Canadian game as much as the league’s founders. Iconic Canadian business professionals built the CPL with the sole purpose of developing soccer in a country that’s full of young talent that, until now, has had to look elsewhere for opportunities. The league’s unique rules and regulations are designed to develop homegrown talent. Rosters are predominantly Canadian and clubs are required to insert at least six Canadians into their starting lineups. Three spots on each CPL roster are reserved for players 21 years of age or younger. Similar to comparable league’s around the world, CPL clubs are mandated to feature under-21 players for at least 1,000 combined minutes. The CPL’s founding clubs are based in Canadian cities from coast-to-coast — HFX Wanderers FC (Halifax), York9 FC (York Region), Forge FC (Hamilton), Valour FC (Winnipeg), Cavalry FC (Calgary), FC Edmonton and Pacific FC (Vancouver Island).